The Echo Canyon climbing areas are located within the Henefer-Echo Wildlife Management Area. The Utah Division of Wildlife Resources closes all access to the WMA each year from January 1 to the second Saturday in April to protect wintering wildlife. The Roadside Crag is a short wall (35'-50') that sits about a half mile East of the Dry Wall. It basically touches the road, so there is no approach, and there aren't many options for parking. 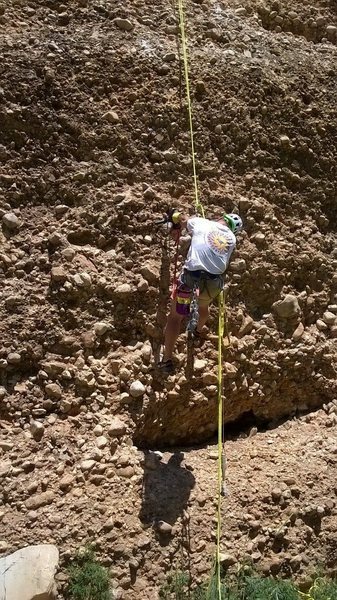 There are currently 6 routes ranging from 5.7- to 5.10a. They are well protected with many bolts. Approach as per the Dry Wall, continue East for about a half mile until you see the short wall and all the shiny new bolts. The boulders on the topo are also a good landmark to watch for. Super fun crag to stop by. Excellent place for a new leader. The bolting is as close as it can be without being a bolt-ladder. You'd have to try to whip here, 12 draws (plus anchors) on the 50 foot route.